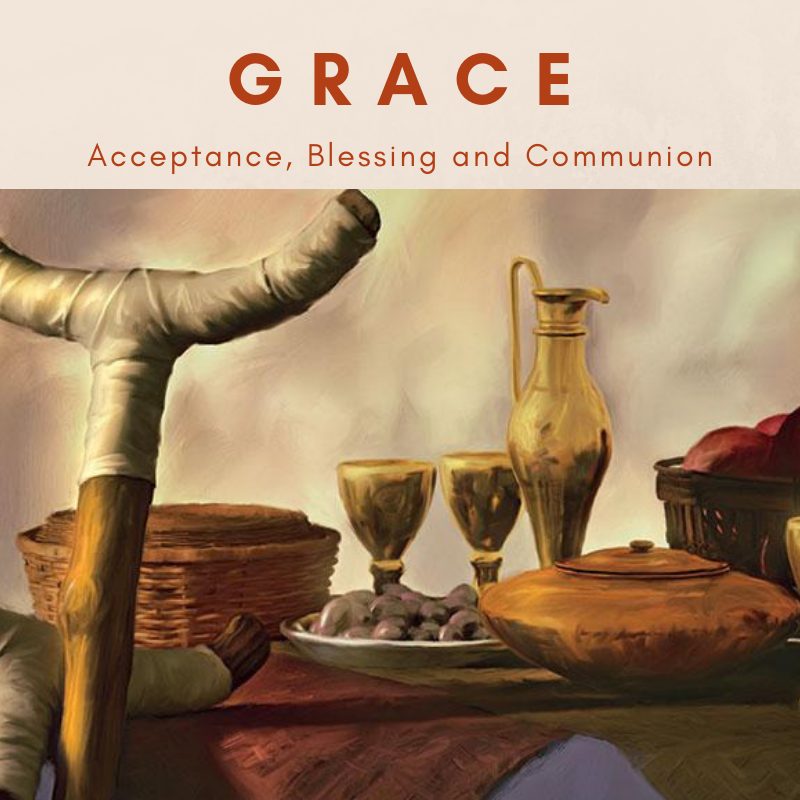 GRACE: Acceptance, Blessing, and Communion This message was preached by A J at Word of Grace Church on October 7th, 2018. To listen/download the audio please click here. To listen to the Sunday's worship and prophetic contributions please click here. David was a blessed man and a man after God’s own heart. This section of the passage enumerates all the counties and armies that David defeated. In the middle of this enumeration, there is a story of Mephibosheth. It’s a story with the most important concept a cornerstone of our faith – The Grace of God. When God spoke to Abraham, he promised him that he would be a blessing and make his name great. The whole purposed of your life is to be a blessing. We are blessed, for the purpose. This is what we are to do – be a blessing in the world. 2 Cor 1:3-4 – Who comforts us so that we can comfort. This is a biblical principal. Whatever we receive in Christ, we, in turn, pass on to others viz forgiveness, love, generosity, kindness and so on. Mephibosheth is Saul’s grandson, Jonathan’s son. I can see the parallel in my life. How David intervened in Mephibosheth’s life, is the way God intervened in our life. Meribal means alternative of Baal / shame. Why or how did he become Mephibosheth i.e. shameful? 2 Sam 4:4 – He became lame because a nurse dropped him and he got crippled. The fall crippled him. In Gen 1:1 – There was nothing and then God created everything out of nothing. He made man and woman. In their desire to become like God, they fell and the consequence is separation from God. The consequence is more than this. Rom 8:6-7 – We became hostile to God. John 3:16 – When we believe in Jesus, we have eternal life. However, God was never our enemy. Rom 5:8 – While we were yet sinners, God loved us and Christ died for us. Lo Debar – It’s a place of no bread. I did not know Jesus. I only knew him as a prophet. I came with my religious baggage. Therefore, though, outwardly, I was awake, inwardly I was asleep and dead. Responding to God is the most important thing you can do for the rest of your life. Our forefathers did that. Abraham, when God called him, left his father’s place. When God spoke to Moses, he gave many excuses but he did go to Egypt. Peter and Andrew left their nets at once. Saul became Paul and his life changed in a moment. I went to a meeting skeptical. When people began to pray for me, I started sobbing, weeping and in the middle of that, I experienced peace. At that moment, I saw my life flash before me and I heard God say that he was going to wipe out all my wrongs forever. I stood there asking in my heart, “Who are you? who is showing me all this?” In my heart, I heard Him say, “I am Jesus” and my heart changed forever. If you’re wondering about this I invite you to call on the name of the Lord and you will be changed forever. Mephibosheth was filled with fear because the king was his supposed enemy. He threw himself at the feet of David. David showed him kindness. This is the call of grace in his life. Grace brought blessings, acceptance, and communion. David and Jonathan made a covenant with each other and looked after each other’s family. Why have we been shown kindness? We are accepted because of Jesus. He died on the cross and took our shame and guilt. He sent the Holy Spirit and we have him. Eph 1:3 – We are chosen before the creation of the world. The father knew where we would be born, and what we would believe and still he chose us. This is massive. The call of grace brings acceptance. The call of grace brings blessings. Mephibosheth got more blessings in David than what he has lost in Saul. David more than made it up to him the losses he incurred because of Saul his grandfather. Rom 8:32 – How will he not give us all things. Every promise is yes and amen. Call of grace gives communion. Verses 8, 10, 11, 13 – He ate at the king’s table. We sit in the presence of God because of Jesus. When Mephibosheth sat at the king’s table, his feet were covered. Our brokenness is covered in Jesus. Imagine how much his life has changed. He was going to eat at the king’s table for the rest of his life. He was blown away! He was in awe of the King. He felt unworthy of David’s kindness. Ps 8:3 – What is man you are mindful of him? This should be our response to the great grace of God. Let’s respond to God because of the acceptance, the blessing and communion we have in Jesus. Word of Grace is an Evangelical (Born Again), Spirit-filled (Charismatic), Reformed, English speaking church in Pune that upholds the Bible as God's inspired Word for life. We are a church community that have people from every part of India and parts of the world. We are here to put the Great Command and the Great Commission into practice by equipping and releasing every member into works of service. Word of Grace is a part of a wider international family of Churches called RegionsBeyond.To know more about us please log onto www.wordofgracechurch.org.